The Fortress is an area in Hiberhiem in Divinity Original Sin: Enhanced Edition. Upon nearing the area, you will find The Guardian. This is a level 12 shambling oak boss, which means he can be easily killed with the wand that you get from Hilda's Pet. If you want to fight him head-on or you have not met Hilda yet, be prepared because the fight is very difficult due to The Guardian's high resistances. After vanquishing The Guardian, there are several traps you must bypass and disarm. Throughout the area there are multiple sentinels, which are invulnerable, which activate surface hazards when they have sight of you. 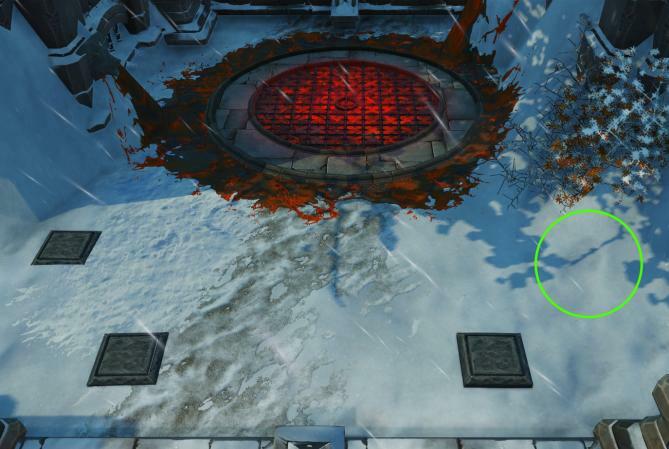 The first trap is a large lava pit that can be disabled by four pressure plates. As seen on the right, three are visible and one must be dug up. The staircase directly above this has several freezing mines, so be sure to deal with them. At the top of the staircase is a statue that periodically lets out a freezing pulse, so wait until the coast is clear before attempting to pass. There is a level to the left of the closed doors, which will open all doors and disable some traps. Inside you will meet the missing wishing-well from The Wishing Brother and a locked chest (if you didn't already loot it when you first got here from the teleporting well). Next you must get past some lava, so the skill winged feet is very useful ( Tornado does not remove lava as long as the traps are still active). Activate winged feed and go to the side with the chest. Behind the sentinel is a lever which opens a locked gate on the other side. Go to the other side and, with winged feet again, activate the newly accessible lever. This opens the gate blocking the chest. Inside the chest is the Royal Guard Talisman, which is needed to get the Winter Ring in King Boreas's treasure room. Don't forget to return with the well teleportation spell, which will complete The Wishing Brother quest.